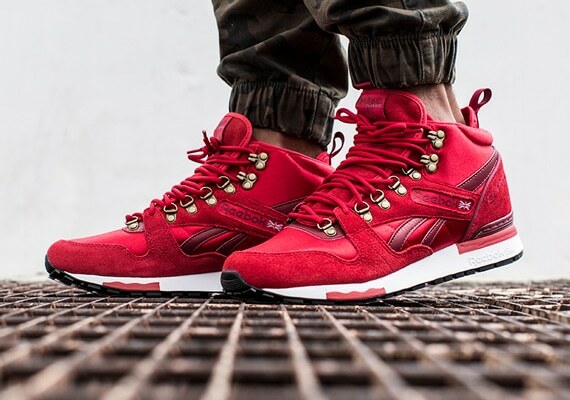 Turning the Reebok GL 6000 into a hiker seemed like a terrible idea. We love the 1986-era runner for its high mileage looks, forefoot sway bar support, dual density midsole (Reebound is an underrated name for a technology), heel counter and flex wave insert. In its day it was second to the LX 8500 (because 3M seemed like a really big deal back then) in the rankings of Reeboks that could make you into a playground hero. It’s a shoe that got a mehhhhhh retro a decade or so ago, a better retro a little later and a really good one a year or so ago (we loved that big woven label). But as a trail shoe? Not something we’d go for. We never understood the Reebok Classic Mid at all, so this seemed equally misguided. But somehow, it’s pretty great — even the weirdly anachronistic neoprene lining that puts the design on a collision course with 1991 works and the tongue cover detailing indicates that someone really sat and thought about this one. The odds were against the GL 6000 Mid because of our reverence for the original shoe and our total boredom with D-rings and classic running shoes being made into boots, yet this go hard. Maybe we’re just fiends for grey shoes with orange laces. These are online now.